I don't know about you, but just looking at this picture of paella makes me hungry. I'm a big fan of paella, but never in a million years did I think that I could cook up this Spanish staple dish. I'm not too bad of a cook, but something as complex as paella? No way. And so I was elated when Mary Luz Mejia from Sizzling Communications invited me to attend one of Pimenton's paella classes. I know absolutely nothing about Spanish cooking, but never fear, chef Jose Arato is here! And thank goodness for that. Owner and head chef of Pimenton (@PimentonTO), Jose Arato takes his Venezuelan background and many years as a chef at the Hyatt Park Hotel to everything that he does. Pimenton offers lots of cooking classes, catering, charcuterie, wholesale, cooking supplies, and food to go. To ensure that we weren't salivating all over the paella ingredients, Chef Arato made sure we were well-fed right from the start with a couple plates of tapas. Good thing, because coming here from work I was starving and probably wouldn't have lasted an entire class! Too bad they weren't part of the lesson because they were delicious! I would later find out later that Pimenton offers a Spanish Tapas class, so will definitely be looking into that. Chef Arato has intentions to add more classes such as a wine pairing class for Spanish dishes, which would be taught by himself and a professional sommelier. After some introductions and words from Mary Luz, the learning begins. We went backwards in preparing the meal, making the dessert first. Ice cream in simple steps! After some vanilla bean scraping, egg beating, and boiling, voila! A concoction for a delicious Turrón Ice Cream, which is served withwith Ibiza sea salt and olive oil. I don't know about you, but when I first heard that combination, I was a little taken back. The combination doesn't sound very appetizing, but believe me, it was a holy matrimony. More on this later. After that, it was on to the main event. I was a little nervous at first not knowing the first thing about making paella, but Chef Arato is so knowledgeable and welcoming of any and all questions, each step of the way. I definitely learned a lot! The class is really hands, even for the prep work. We basically readied all the vegetables to be cooked and even learned how to prepare squid, mussels, and clams! If a clam is open before cooking, it's not fresh anymore. Dispose. Add a dash of salt when chopping garlic and other herbs which will serve as an abrasive and allow for a finer mince. After all the prep work, off to the stove! Adding lots of stock. It's important not to let it dry up! Even heat is key to paella, so only flat-bottom pans should be used. Cook shrimps with the shells on. They hold a lot of the flavour. Taste your soup before after adding salt. The soup should be saltier to taste because you will need to replenish the stock base as it cooks. Extra salt will ensure there is enough flavour for the rice to be added. After all your ingredients are cooked, the rice is the very last thing to be added. Chef Arato spent a good amount of time talking about paella rice. From the passion in his voice and the way he carried that sack of rice like a baby, you can tell how much he loved his rice! Turns out paella should always made with Bomba rice. Just as there are different knives for different tasks, there are different grains for different dishes. Unlike most other rice that are long and lengthen when cooked, Bomba rice expands 3 times fatter and has a lower startch content. 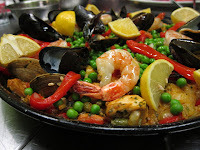 As a result it is extremely hard to over cook, and just what you need for paella. And if you're googling where to get Bomba rice for your next vat of paella then i'll save you the trouble. Pimeton is one of the very few places in Toronto you can get the rice without ordering it online. And now the best part: the eating! After being tortured by all the wonderful smells, at the end of the class everyone gets to partake in decorating the paella and consuming their cooking successes. Chef Arato prepared an Escalivada (grilled eggplant and pepper salad) and some sangria, instantly making it a full course dinner! And of course no meal is without the desserts. Like I said, the combination in the ice cream sounds a little off, but it was anything but that. You really taste the flavours of the olive oils, and the sea salt pairs perfectly with the sweet silky ice cream. Aside from ice cream we also had a gluten free almond cake which was absolutely heavenly. Can there be a class for this too please?